Are you looking for great value accommodation in a central location? Then Flann O'Brien Rooms 3 Star Guest House is the place for you. We offer quality rooms equipped with everything you will need and a fantastic location for exploring the city. We are close to the sights, shopping, eating and drinking, culture and transport for further exploring. Our friendly and welcoming staff are available to help and advise you, and our Irish pub across the road offers a great atmosphere and breakfast lunch and dinner. 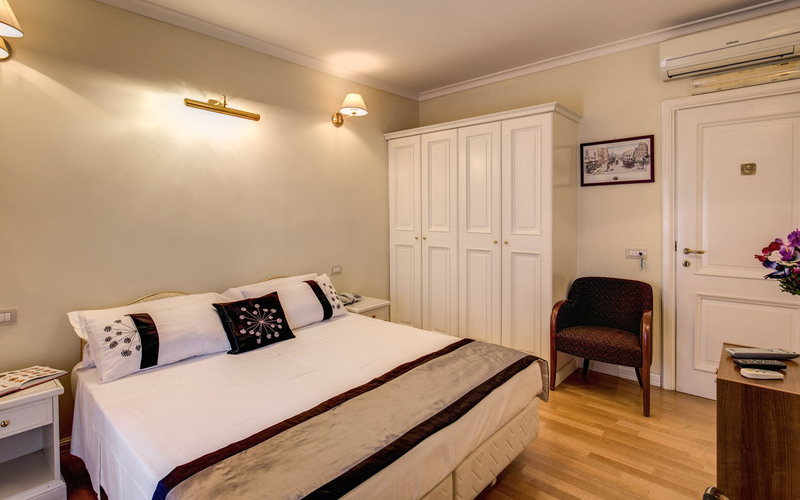 Flann O Brien's rooms offers bed and breakfast accommodation in a central location for couples, families or groups of friends in double or triple rooms, all with en-suite bathrooms. Our recently renovated rooms are bright, modern and spacious with wood flooring and include all mod-cons including air conditioning, free Wifi, TV and mini-bar. A great place to crash after a long day of sight-seeing, we offer comfort and convenience at an affordable price. 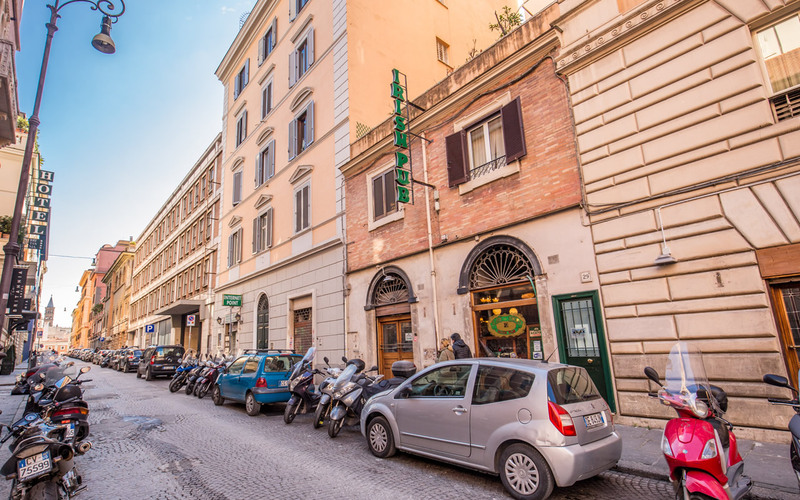 Flann O'Brien's Guest house enjoys an enviable position on Via Nazionale in the centre of Rome, within walking distance of the major tourist attractions, bars restaurants and shopping. 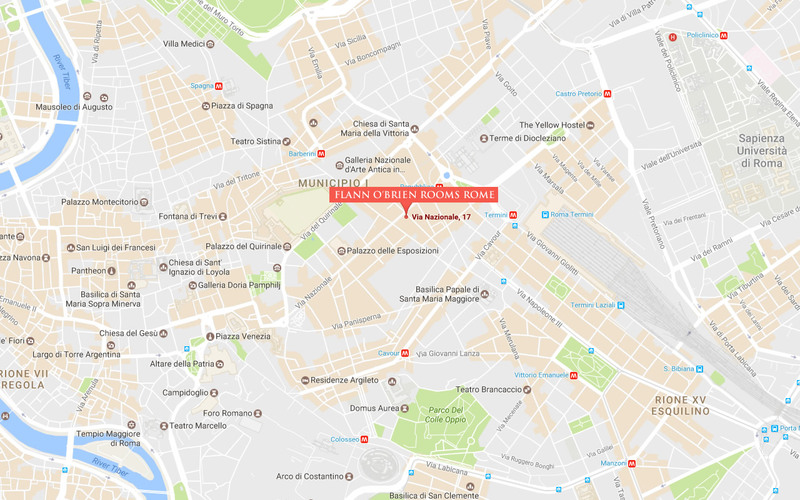 If you want to save your feet, we are just 300 metres from the metro station Repubblica and a ten-minute walk from Termini station, the transport hub of the city. From here you can access the A and B lines of the Metro, bus and tram network. Flann O'Brien rooms Guest house delivers on price and location and has a great feel about it too. Our multi-lingual staff are friendly and welcoming and can advise you on reaching sites, restaurants or getting tickets for major attractions. After a long day you can kick back in our Irish themed pub with a cool pint and plan your evening's activities, soak up the international atmosphere, watch the game or enjoy a meal inside or out on the street-side terrace.